Frontal affinity chromatography (FAC) is a simple and versatile procedure enabling quantitative determination of diverse biological interactions in terms of dissociation constants (K d), even though these interactions are relatively weak. The method is best applied to glycans and their binding proteins, with the analytical system operating on the basis of highly reproducible isocratic elution by liquid chromatography. 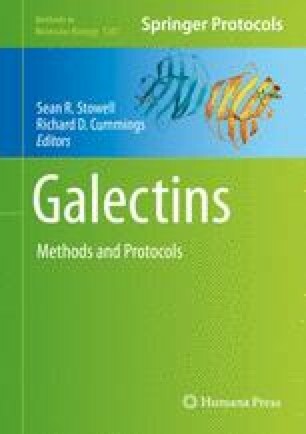 Its application to galectins has been successfully developed to characterize their binding specificities in detail. As a result, their minimal requirements for recognition of disaccharides, i.e., β-galactosides, as well as characteristic features of individual galectins, have been elucidated. In this chapter, we describe standard procedures to determine the K d’s for interactions between a series of standard glycans and various galectins.